So today, to kick off my Dates With Dublin project, I went on my first “date”. Not unlike other dates I have previously embarked on, it proved to be shorter than expected and not very interesting, with minimal conversation and a bit of head-scratching. I think this one might have been a record, though, clocking in at about three minutes. But it’s a start, right? On the way to do the grocery shop (oh, the glamour of a bank holiday weekend!) I swung by the Bottle Tower near Churchtown. It’s a place that’s caught my eye before, but thanks to a suggestion from Julia over on Facebook, today I decided to pull up outside and go in for a nose. The Bottle Tower (also known as Hall’s Barn) appears to be located on the grounds of a private residence, but nobody came running out with a pitchfork when I stepped through the gate, so I took that as an open invitation. I had a good nose around, as I’m wont to do, but there’s really not a lot more to see than what you can see above, as you can’t access the back of the structure. But it’s kinda cool, isn’t it? There’s no information at all visible around it, so I came home and turned to my trusty friend, Google. 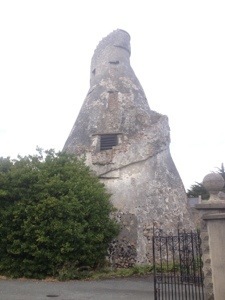 There’s not much information online either, but from what I can glean, the structure was built in the 1740s, when Ireland was in the grip of a famine, under the direction of the wife of William Conolly of Castletown House, Leixlip as a means of giving local people a way to earn a living. The barn was built on the grounds of the now-disappeared Whitehall House, after which the road it stands on is named. Apparently its purpose was to act as a granary, though there is evidence of a living area inside too, with a couple of fireplaces. The staircase you can see around the side isn’t safe to climb anymore, but leads to a small platform where you could look out over the surrounding areas – this was potentially used for shooting game, back in the day. More than likely, the building is based on the design of the Wonderful Barn in Castletown House, which is in much better nick – these are the only two buildings of their type in Ireland. They’re pretty distinctive. And that’s about as much information as I can lay my hands on for now – if anyone local is reading this, I’d love to know more. Your first venture into “Urbex” 🙂 You might get hooked! I had to find out what “urbex” meant, Denis, but yeah, I just might! Now if only I had a photographer’s eye …. I live down the road from this and I know about as much as you. I always knew it was built during the famine to give work to local people but nothing more. I think it was actually the famine in the mid 1700s though, not the Great Famine. I’m due to submit my thesis next week so I’ll have more time on my hands and I’ve been meaning for ages to do some research on local history, so I’ll add this to the list.